While lead-acid batteries in the course of the years have become smaller and more powerful, their principle to generate electricity has not changed. With SHIDO lithium-ion batteries this principle has changed completely. Power is generated via LiFePO4 (Lithium Iron Phosphate) cells based on lithium and carbon, so they do not contain lead or acid. 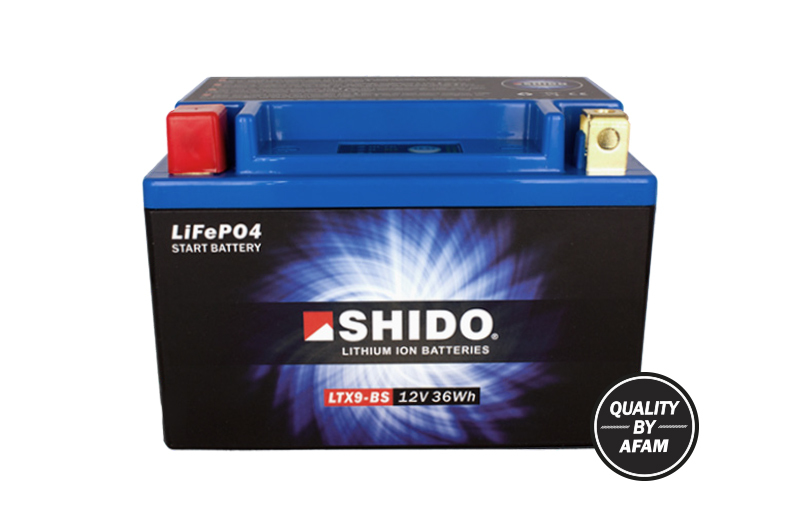 Shido Lithium batteries have 4 cells LiFePO4 (Lithium Iron Phosphate) of 3.2 volts connected in series in order to reach an OCV of 12.8 volts. A perfect voltage to use as a starter battery for motorcycles. The electronic Battery Management System or BMS spread the charge and discharge regularly over the four cells. Thanks to its small internal resistance a Shido Lithium battery can generate a very high starting current with little Ah. This starting power delivers a powerful and quick start of the vehicle. Higher starting power, due to its low internal resistance the battery can provide more rapid start capability, resulting in a faster and easier start. Approximately 70% lighter in weight. Very low self-discharge, even after unused for one year you do not have to load the battery. Longer service life with more than 1200 full charge and discharge cycles. No capacity loss over its lifetime. Lead-acid batteries lose capacity over time and can possibly sulfate. Reduced gasoline consumption by a stronger spark from the spark plug. 1 to 1 replacement for lead-acid batteries, to build in easily. The shape and connections match with your lead-acid battery. Super-fast charging time. The battery can absorb more quickly charging Amperes due to its low internal resistance. Safe, LiFePO4 cannot explode or burn. Stable discharge voltage thanks to the integrated Battery Management System (BMS). No pollution, the battery contains only biodegradable and recyclable elements. Always use a specific lithium charger/maintainer. Cannot leak and can therefore be mounted in any position, even upside down.